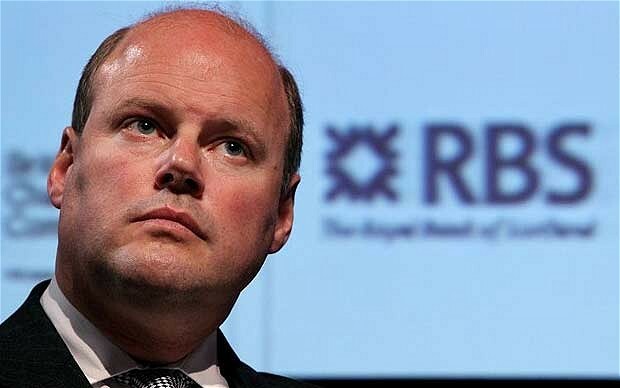 Royal Bank of Scotland’s chief executive Stephen Hester faced opposition to his proposed £1 million bonus from all quarters – few on the right including Tory ministers were prepared to defend him – and last night he yielded to the inevitable. No one comes out of the affair smelling of roses with his decision to waive the shares. Hester should have seen the writing on the wall weeks ago; the RBS remuneration committe misjudged the country's mood; the Government, as the bank’s controlling shareholder, should have twisted his arm; and Labour should never have agreed such a lucrative contract when it was in office. Hester is not in the clear. He enjoys a fat salary and he has handsome longer term benefits headed his way. The bank’s senior executives are in line for multi-million pound bonuses, while managers who are made redundant will receive golden parachutes to help their exit. It’s sickening MPs have been baying for Hester’s blood when most of them have escaped serious censure for fiddling their expenses. The RBS boss hasn’t broken any laws. Sometimes it reads as though he was in command when RBS was driven on to the rocks rather than the man brought in to get the bank ship-shape so taxpayers can get their money back. Finally, the great British public's sense of priorities doesn’t emerge in a favourable light. Its fury at the size of Hester’s bonus doesn’t square with its passivity when encountering eye-watering soccer and showbiz salaries; nor its something for nothing enthusiasm for big prize games shows and the lotto.